Dental care for kids should begin at an early age, with simple steps like regular brushing and flossing, and biannual dentist visits. Pediatric dentistry can be quite different from dental care for adults, because kids’ teeth are different. Dental pediatricians specialize in treating kids, and even their offices are set up to reassure kids who might be nervous about a dental visit. Dental care is important for kids, because it teaches them good oral hygiene habits for a lifetime. The lack of dental care can also create problems ranging from toothache to other health problems. Even though it is important for kids, as many as 20% of kids in the U.S. lack dental care. This can lead to problems like tooth decay. In fact, about 40% of all kids already have at least one cavity by the time they are enrolled in kindergarten. Dental cavities are a bigger health problem for kids than juvenile diabetes, by a factor of twenty. They are five times more common than childhood asthma. Tooth pain can lead to missed school days. All together, kids miss 51 million school hours each year due to dental problems, according to the Center for Health and Health Care in Schools. Dental care can begin with babies as young as four months, when the first teeth become visible. At this stage, you can begin cleaning the new teeth with a washcloth, before moving on to a small toothbrush with soft bristles. Visits to the dentist should begin at age one, and continue on a semi-annual basis thereafter. Regular brushing and flossing are important for kids, to keep their teeth healthy and go learn habits that they will need all through their lives. Many people feel that dental care for kids isn’t that important, since they will grow a second set of teeth later. However, the baby or milk teeth act as placeholders for the teeth that will come later. Any problems at the early stage will be carried over into later life. 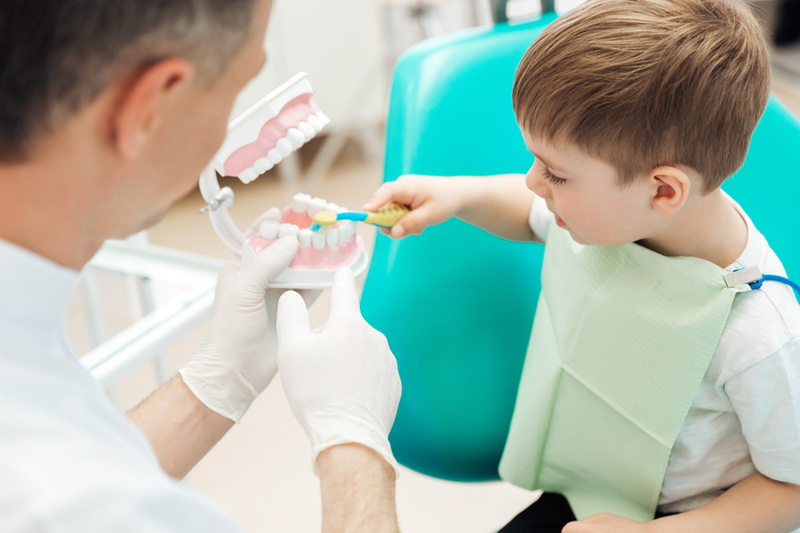 When dental work is needed, whether it’s a routine cleaning or an emergency toothache, a dental pediatrician is the best qualified person to provide children dental services. That’s because kids’ teeth are quite different from adults’ and need special care. Most kids are also afraid of dentist visits, and childrens dentist offices are set up to reassure them. For kids who are really afraid, sedation during dental procedures like cleaning is an option. Kids develop oral hygiene habits in their early years, and parents can help them to get a good start. Regular brushing and flossing and semi-annual visits to a dental pediatrician can help them avoid problems.